Ardel Engineering is an ITAR registered CNC machining shop dedicated to providing precision parts and components for military and defense technologies. ITAR, or the International Traffic in Arms Regulations, is a series of controls designed to restrict and regulate the export of products with defense industry applications. Ardel Engineering is committed to being an ITAR compliant machining shop, manufacturing high-quality products for military, defense, and government clients, and specializing in aerospace applications. We offer an array of precision machining services including Swiss screw turning, CNC machining using various mediums, and wire EDM, as well as mulitple value added services that include MIL-SPEC anodizing and filming. 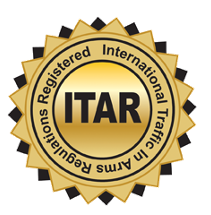 You can be assured that our company adheres to all ITAR requirements provided by the State Department. If your next project requires precision machined components from an ITAR registered company, please use the form above to contact our team, and learn how we can assist you.